Butterfly Keychain. Approx. 1.5" x 1.5". 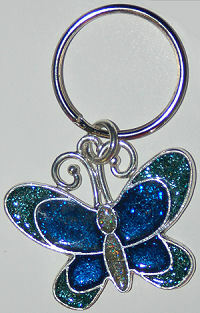 Pretty metal blue butterfly keychain with glittering finish. Has secure key ring so keys don't fall off. Pretty metal blue butterfly keychain with glittering finish. Has secure key ring so keys don't fall off. Comments: Wow I wasn''t expecting to get such a solid well made product for $1.75 When I opened them they were solid and something I surely would have thought I would pay much much more!